As you can see, we're connecting to the encrypted() signal of the socket in order to ensure that we get informed as soon as the SSL handshake is complete, and before any sensitive data (like cookies) are transmitted to the client. Unfortunately, this is also the cause of one of the problems of the implementation with the current Qt APIs as I'll describe later. Since we're using QSignalMapper to let us know which socket we're dealing with in any given call, we first cast the QObject pointer we're given down to a QSslSocket. This means we can now call all the SSL functions. First we extract the name of the 'peer' (this is a fancy name for the site we're connecting to). The next two lines are actually part of an optimisation - since we'll often get repeated calls for the same site, I've added a simple single-entry cache that lets us quickly handle two requests that follow one after the other. A more complete implementation of this concept would probably use a slightly larger cache. If we've just accepted the site, then we know that there's no need to go through the full set of checks again, so we simply approve it immediately. The next step is to check that the cache itself exists, and if not then create it. In this example, the cache is simply a directory that contains a file named after the host being visited. In the file, we store a cryptographic hash of the certificate that was used. Finally, we get to the real meat of the class - the algorithm that determines if we should warn the user. This checks if we have a cached value, and if so checks for differences. 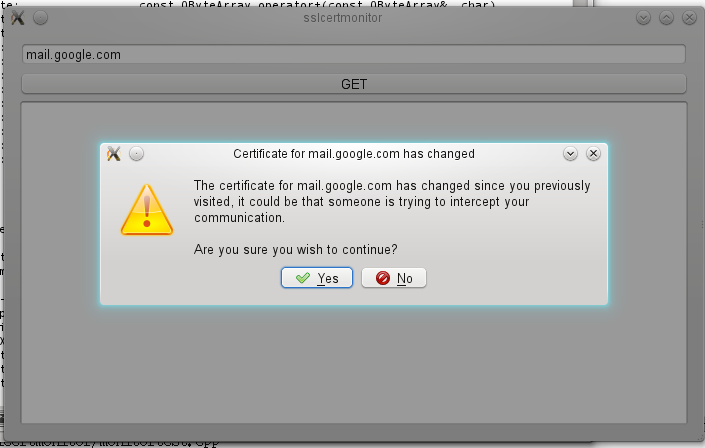 If the certificate has changed then the signal certificateWarning() is emitted. // Have we been here before? // then we store the updated entry. It cannot be extended to QNetworkAccessManager right now as that neither gives us access to the underlying QSslSocket nor provides a function for encrypted() that is analogous to the sslError() forwarding function. Since we need to tap the encrypted() signal, it's not safe for the application to send data in response to this signal (which is the way it is normally used). We really need to have a signal that works immediately prior to the one the application uses, or get the application to use a signal sent by this class. In addition there are some easily fixable issues, for example it doesn't track the date or anything else from the certificate. This could easily be added though eg. by using the modification time on the cache entry. This is a good time however to be finding that there are API issues since there are plans for a reworking of the QSslSocket APIs for Qt5. Hopefully experiments like this will let us significantly improve things for the future. The code as usual is in my qt-examples gitorious repository. <svuorela> can it handle several certificates for the same domain ? <svuorela> so if I have 100 servers behind mail.example.com with different certificates and a round-robin dns, I will get asked each time ? A slightly improved version is here. This one has a proper cache for the recently visited sites and always validates the certificate digest. That dialog is sorely missing the "Details" button which is on the invalid SSL certificate warning dialog, i.e showing what the heck the offending certificate actually is. Even nicer would be to be able to compare the 2 certificates (and there should be a special warning if the certificate authority has the same user-visible string, but a different key fingerprint). Yes, this is just a proof of concept. :-) There are a number of improvements to make, and showing you the certificate is definitely one of them. Caching the whole of the old cert, not just the digest is probably a worth while improvement as you say. One thing to note is that as pointed out by Jan Kundrát the fact that v1 only checks the name of the peer on the second identical connection is a serious weakness. The version 2 I mentioned in the comment above addresses this by always verifying the digest. There are a number of things that are needed to make this production ready, particularly making it so that it can be used with QNetworkAccessManager which will require some API changes to Qt. Fortunately I'll be at the contributor summit and we already plan to rework the SSL support then.